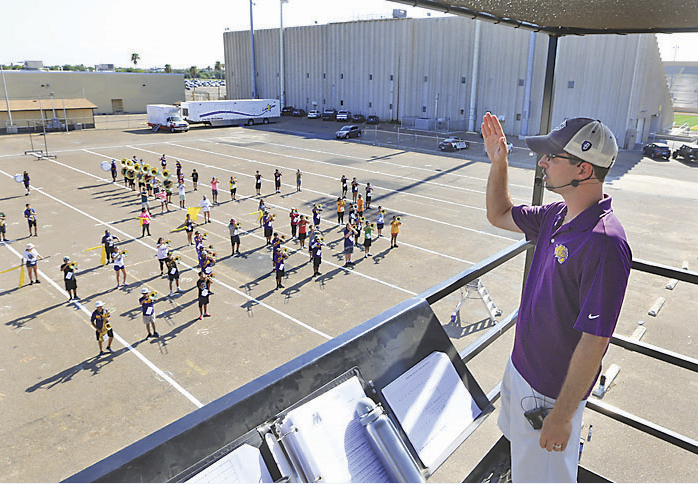 McALLEN — The sun was unrelenting Friday morning, as it had been every day since the McAllen High School band students began their marching rehearsals last week. 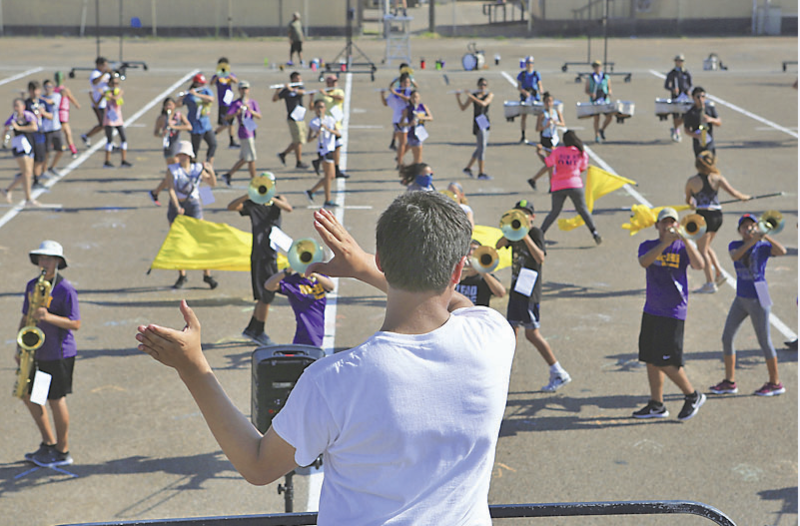 While the heat continued to verge on unbearable that morning, the breeze offered some respite to the McHi students as they rehearsed this year’s marching program. 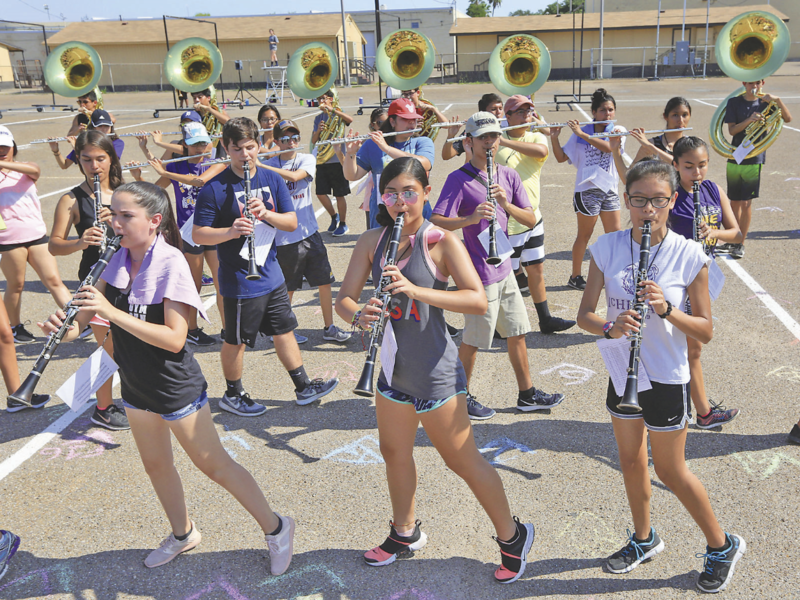 They are among the many high school band students across the Rio Grande Valley reporting for practice at 8 a.m. on an August day as summer marching band rehearsals are now in full swing. On a parking lot just outside of McAllen Memorial Stadium, the McHi students began in block formation, practicing their backward and forward marching technique over and over again. Then they marched back and forth while simultaneously playing scales on their instruments to the bleating of a metronome. After practicing how to properly step forward and back, as they do every morning of rehearsal, they finally began working on their show. The eight-minute program they perform at competitions and during halftime shows at football games is different every year and takes several weeks to learn. 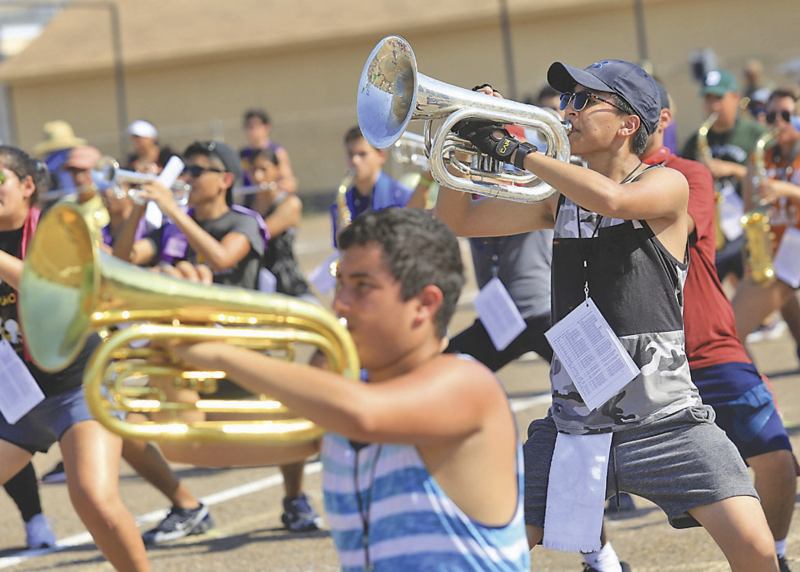 Though rehearsals for the McHi students began on July 23, the first few days were just devoted to learning marching fundamentals as UIL rules don’t allow them to start learning drill for the show until Aug. 1. On this day, McHi Band Director Jason Dunn said they would finish learning the first movement of the program. Because the heat can be overwhelming, the students are provided water but also urged to bring their own water bottles. For 15-year-old Angel Guerra, baritone section leader, the heat is the worst part of being in marching band, however, the feeling of performing their show makes it all worth it. “Once we’re at the end of the show, once we finish everything, and performing for the people and seeing the people clap for us, that’s a special feeling for me,” he said. But reaching that moment takes a lot of hard work, from the long hours to memorizing all the music, said Eric Martinez, 17, who leads the band as a drum major this year. However, freshman Vivian Tanguma, 14, has been around marching bands since even before she joined one since her older sister was in the band as well. Despite the heavy schedule, which has often led her to decline invitations to hang out with friends, the enjoyment of band and the people made it worthwhile. Martinez also acknowledged that their group of peers was friendly and accepting. Band is a worthwhile experience, Martinez said, agreeing that the common trope of high school being a horrible rite-of-passage was not true for everyone.